I flew via Cebu Pacific, AirPhil Express, ZestAir and Philippine Airlines so much that I thought they are the only airlines that fly to the different destinations in the Philippines. I was surprised that my boss booked a flight at TigerAirways for our trip to Subic. TigerAirways is one of the many budget airlines that are popping out like mushrooms in the airline industry. The competition between budget airlines is so fierce that they are topping one another in offering discount flights to travelers. One night, my Beloved discovered a one (1)-peso discount fare from TigerAirways. After booking a flight, we discovered that TigerAirway's 1-peso discount fare cost less (after adding the taxes and surcharges) that the 1-peso discount fare of Cebu Pacific that we booked in the past. Because of this, I decided that I should subscribe to notifications of discount fares from TigerAirways. Step 2: Since I am cheapskate, I just clicked on the “Sign me up just to receive your regular e-newsletters” link. See the pop-up window on the image below. 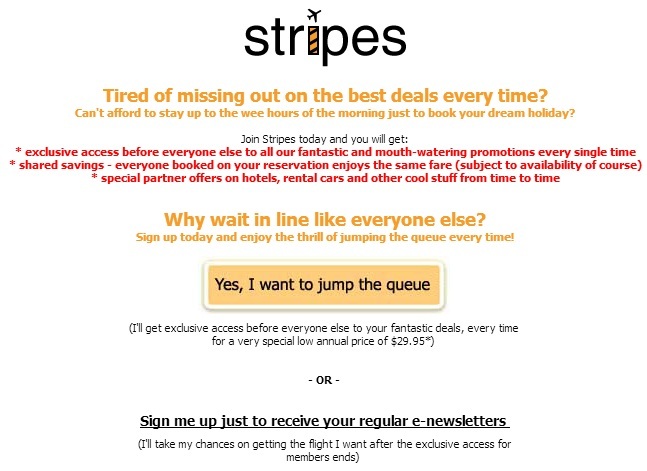 You can also opt to join the Stripes but you should have a $29.95 to pay the yearly subscription fee. Joining the stripes is recommended for those who travel very frequently. Step 3: I then fill-up my name, e-mail address, mobile number and other contact number on the form. I then clicked the “Request for subscription” buttong after I filled-up the form. Step 4: I then go to my e-mail and checked my inbox for the confirmation message sent by TigerAirways. I clicked on the link found in the confirmation message to finally verify my subscription to TigerAirways e-deals. You have successfully subscribed to our Latest Deals Newsletter! A confirmation message has been sent to your email address. And that's it. All I have to do now is to check my inbox for news of discount fares from TigerAirways.